Is 4:3 really the way forward? The LG Optimus Vu has been shown off at MWC 2012 and provides a different take on mobile computing as it boasts a unique 4:3 aspect ratio screen. A direct rival to the Samsung Galaxy Note, LG is well aware of the competition and is keen to point out the advantages of the Optimus Vu over its "competitors". The 5-inch IPS display (1024x768) dominates the front of the Optimus Vu and on the inside you'll find a 1.5GHz dual-core processor, 1GB of RAM, 32GB internal storage, 8MP camera and Android 2.3.6 Gingerbread. The dual-core processor keeps Gingerbread running smoothly and navigation was quick and easy. The Optimus Vu will get an update to Android Ice Cream Sandwich, but LG were unable to provide us with a time scale for this. There is no dead space on the screen when reading magazines or e-books due to their 4:3 size and LG claims the Optimus Vu captures more information on each page. 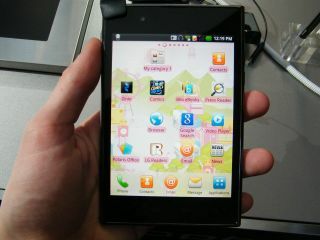 Thanks to that 4:3 screen the Optimus Vu is a big phone measuring 90.4mm in width and 139.6mm in height. LG has managed to squeeze the body to just 8.5mm in depth, thanks to its SiO+ battery technology and the IPS screen – perfect for sliding into a jacket pocket or ladies clutch bag, apparently. Due to the sheer width of the Optimus Vu we found it cumbersome when holding it in one and hand we struggled greatly to reach areas of the screen and the buttons located on the top and side of the handset. You'll need both hands if you want to tap out a message on the qwerty keyboard as the Optimus Vu is too wide to type on one-handed. An Optimus Vu Pen is also included with the handset, but instead of sliding into the phone's case the pen is a completely separate entity which LG has styled on the size and shape of an actual pen. It claims this makes it easier to use than smaller styluses found on other devices. Press the Quick Clip Hotkey on top of the Optimus Vu and you will be able to use the stylus to handwrite over any screen the phone is on, such as circling a location on a map or taking notes in a meeting. Your doodles can then be saved and quickly shared via a host of messaging and social media options. A couple of small grips we have with the Optimus Vu is the lack of a memory card port, meaning you won't be able to expand on the 32GB of internal storage and the fact you can't remove the battery. The Optimus Vu comes with LTE capabilities which pretty much puts a nail in the coffin of any possible UK release, but LG are yet to completely rule out a British launch. The Optimus Vu is now available in Korea and LG is planning to roll it out to other LTE capable countries such as the US and Canada. We're not sure in the Optimus Vu will capture the imagination of the mobile phone market, but the Galaxy Note has had surprising success so LG could well be on to something here.